The STEAM-3D Maker Lab is always on the move. Whether it be our staff providing professional development (PD) to educators, leading Makerspace pedagogy-based lessons to students, or having guest speakers come into the Lab to share their knowledge, our Lab is a bustling place! To see what we have been involved in lately, check out our Lab Events and In-Field Events pages. You can find links to blogs, articles, and other media pieces we have written on our Media Publications Page. Or, keep reading to see where we’ve been mentioned in the press! It is important for students to learn about artificial intelligence — not only in preparation for their future careers which will no doubt feature it in some way, but to develop an understanding of the associated moral and ethical implications. AI can be a lot of fun, especially when experienced through recreational avenues like Cue and Cozmo. However, AI is capable of acquiring and manipulating mass amounts of information in ways that few people are familiar with. While we may not necessarily believe that AI is on the verge of taking over the world, understanding its capabilities is important to being an informed digital citizen. Click the image below to read the full article! Instead of shunning technological advances as threats to the system, embracing change will open up tremendous opportunities. One great example is the STEAM-3D Maker Lab at UOIT’s Faculty of Education, which is a collaborative, learner-centered environment where individuals can come together to build and create. 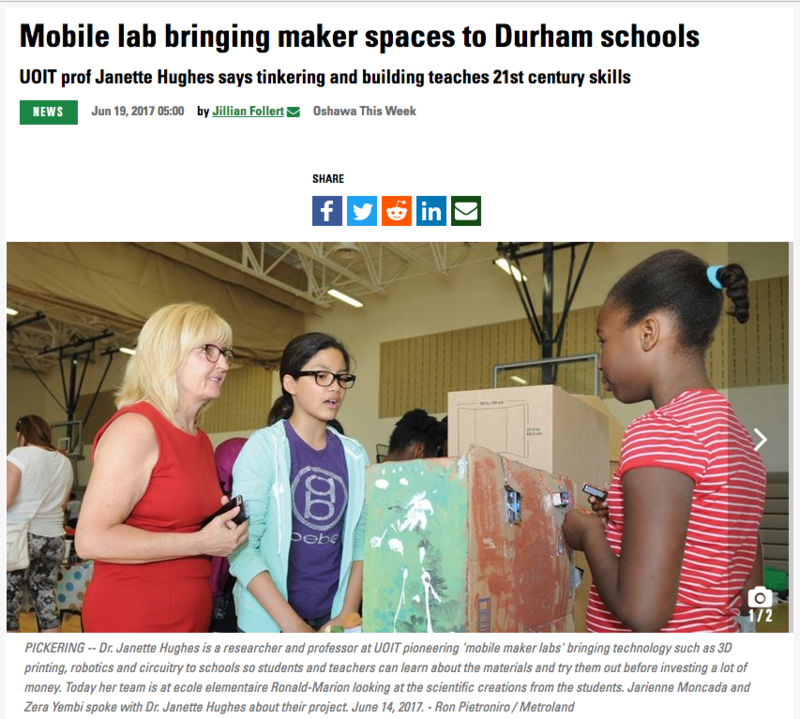 Dr. Janette Hughes discusses the value of STEAM in education, transferable 21st-century skills, and inquiry-based, student-driven learning in this video from Owlkids. 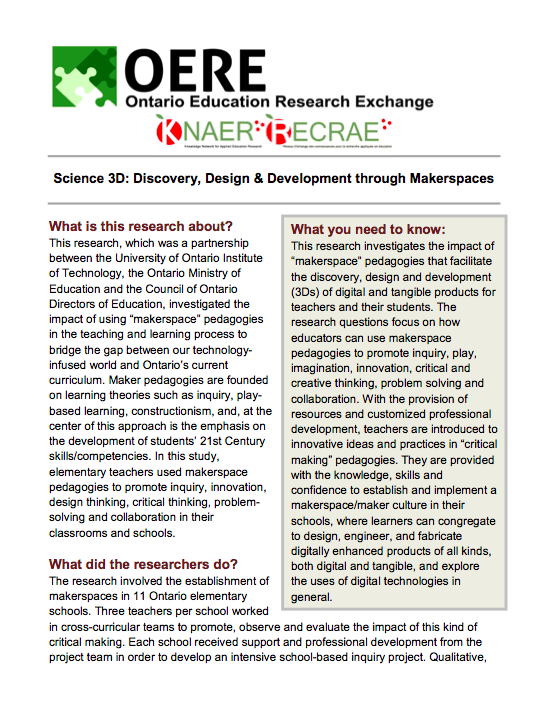 Read about our two-year maker research project — a partnership between UOIT, the Ontario Ministry of Education and CODE (the Council of Ontario Directors of Education). Canadians come face-to-face with challenges and opportunities in their daily lives, and it is research that is at the heart of understanding these challenges and opportunities. The Government of Canada, through the Social Sciences and Humanities Research Council (SSHRC), recently announced a $265 million investment in hundreds of social sciences and humanities research projects at post-secondary institutions across the country, including three projects at the University of Ontario Institute of Technology. To read more about the projects taking place at UOIT, click the picture below. Prince Edward Public School (one of our MOE schools!) 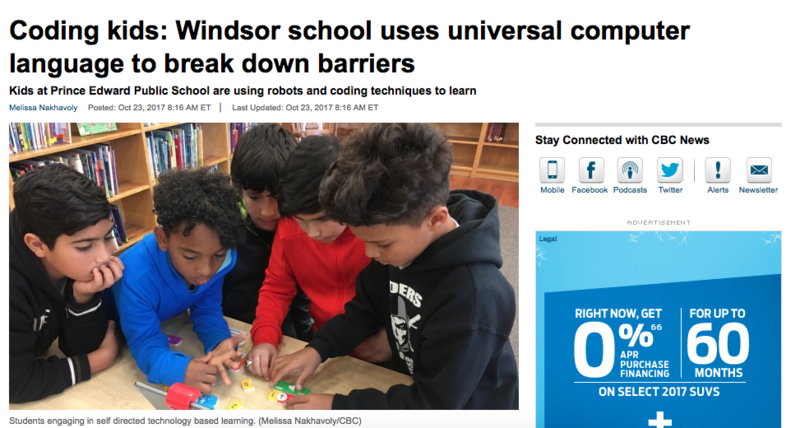 from the Greater Essex Country DSB in Windsor, views coding/making as a universal language that breaks down barriers. To read the article, click on the picture below. To read more about how making (tinkering, building, hacking, un-making) encourages the development of 21st Century skills for students, click on the image below for full access to the article. The STEAM 3D Maker Lab is committed to bringing new approaches to learning into the classroom that benefits all students, especially those are who marginalized. To read more about how the Maker Lab is bridging the digital divide that is apparent in schools, click on the picture below. 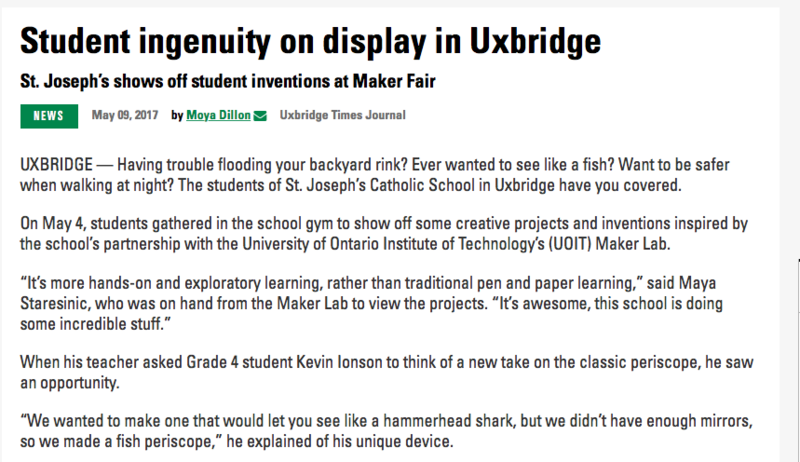 On May 4th, our Ministry of Education (MoE) team made its way to St. Joseph Catholic School in Uxbridge to attend and participate in the schools Makerfaire. Students from the school displayed and showed off their incredible projects and creations to the rest of the school and to the community. To read more, please click on the image below. March Break Maker Camp 2017! This was the STEAM3D lab’s second successful March Break maker camp. To read all about the activities, tools, successes and foci click here or on the image below! On December 6th, 2016, Dr. Hughes was recognized by the University of Ontario Institute of Technology with a Teaching Excellence award. We as students are very lucky to have the support and guidance that Dr. Hughes provides us, and this award reflects the great work she does both as an instructor and supervisor in the Faculty of Education. To see the other recipients from the UOIT awards ceremony please click on the image below. The STEAM 3D Makerspace Team participates in a Ministry of Education and Council of Ontario Directors of Education funded Makerspace Project! Click the image below to read all about it! 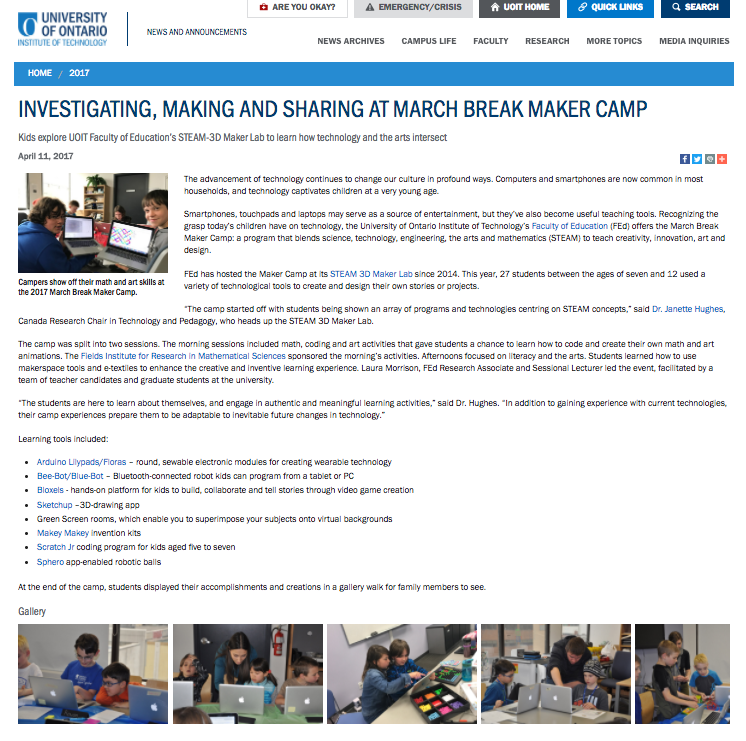 March Break Maker Camp 2016! 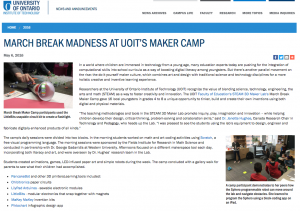 The STEAM3D held its first-ever March Break maker camp this year and it was a huge success! To read all about what we did at the camp, the fun tools we used (with links to the tools’ websites) and participant testimonials, click on the image below! Dr. Janette Hughes is awarded the Canada Research Chair in Technology and Pedagogy! You can also visit the UOIT archives here for more information.